I still have that ratty yellow piece of paper. I think I have hung onto it because it felt so concrete – this map of my fractions. So many things are used to define us but this, this was a beautiful math problem that represented all of the people who came before me. The people to whom I owe my very existence. The people who I carry somewhere in my DNA and more importantly – my heart. Have you taken the time to answer the question? Previous postFrom the Beginning: Where should I look for sources? 1/64 Irish – nice! 🙂 You beat my smallest one. Oh I want to try this! I couldn’t trace all my ancestors to their country of origin, but I have most of them. I’ll have to sit down and figure it out!! It’s amazing how many ancestors we have when we go back a few generations. Hi Sheryl – indeed, many ancestors with each generation! If anyone wants to tell me what I am, go for it!! 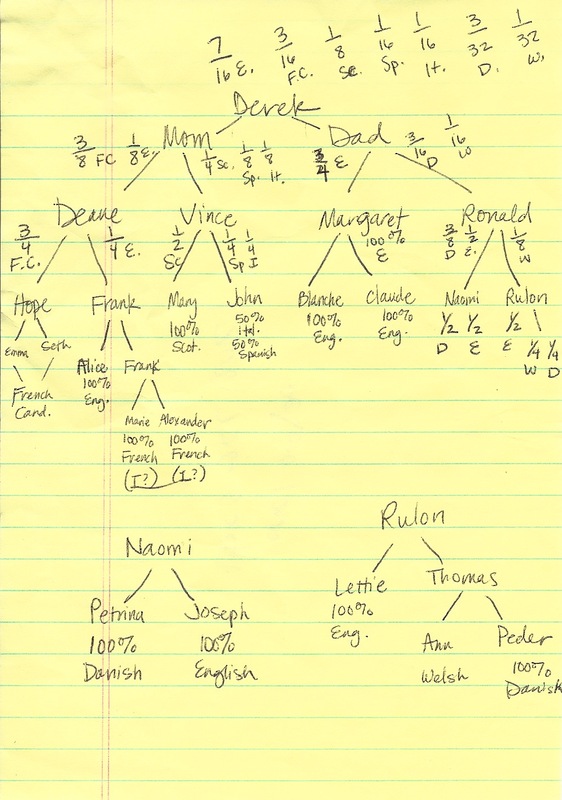 But thanks, genealogy girl, for helping me to see my tree in a new way – Very enlightening putting it all together. Sometimes we get so focused researching the near, we forget the far. Great to step back and look at it this way. © Amberly Beck, 2013-2019. Unauthorized use and/or duplication of this material without express and written permission from this blog’s author and/or owner is strictly prohibited. Excerpts and links may be used, provided that full and clear credit is given to Amberly Beck and TheGenealogyGirl. blog with appropriate and specific direction to the original content.